Traveling with your pet or pets can be a great experience and create memories for a lifetime, but to enjoy a trip fully you must be prepared and that’s what I want to help you with today by finding the best travel bowls for dogs and cats. Not only bowls but also other solutions depending on what kind of traveling you plan on doing. Some water bottles are great for hikes and exploration. I have a cat named Taystee, she has given me a lot of joy and I have only had her for a year. I have taken her traveling a few times when we have gone camping. My wife I and I quickly realized the problem with Taystee’s food and water bowl. They’re big and not very portable. They work great at home, but when carrying them around they quickly felt huge and the food in the food bowl started going everywhere. I didn’t know that there were such great solutions that made both of them more portable and easy to use during travel. There are even water bottles for pets that go on hikes, I mean, how cool is that? Let’s start with the straight to the point picks, and then we will take a look at some products I have chosen. This set from Overland Dog Gear comes with seven pieces that will make traveling with your dog more convenient. It comes with two collapsible silicone bowls, one collapsible food scoop, one non-slip mat, two food carriers, and it all goes into a drawstring bag. In the food carriers you can put food and snacks, but not water. Together they can hold up to 10 cups of food. Each bowl holds 2 cups. Although it’s the second to heaviest product in today’s comparison, this one has the most accessories. The only thing I am missing is a container for water, but that is easy to bring on the side. I like that each item fits in the included bag. It makes it easy to put in a bag or carry between the truck and the trailer or from your home. Products that come organized out of the box are great for RV living because it make them easy to store. Collapsible bowls are light and easy to take outside when needed. This is not the kind of pack you bring with you on a hike in the woods, but one that you put in the car when you’re heading to visit somebody for the weekend. Note that this model is for smaller dogs, there is also a version for medium and large dogs that you can find here! Life4Fun has made something that looks like a water bottle but that can store both food and water for your pet. The water bottle has two compartments, one that can hold 10 oz of water and one that can hold 7 oz of food or snacks. There are also two collapsible 12 oz bowls included. The container is FDA approved by being BPA free, lead-free and using food-grade PP material. LIFE4FUN Water Bottle 2 in 1 is perfect for when you’re going hiking for the day or when you’re going on a picnic. This is the best solution I have seen for a 2 in 1 with both food and water. Portable, easy to use and easy to clean. If 10 oz of water and 7 oz of food isn’t enough for a whole day worth of hiking, you can always bring two containers and have double the amount. What I would have liked to see included is a bag to keep everything in. That would keep dirt and animals out of the bowls. Although advertised as watertight, I also would have liked the water opening to be a screw on so I wouldn’t have to worry about leaks. The lid is screw-on which is great, but the second easy-pour opening isn’t. I am just nitpicking! The food side of the container flips open. The Gamma Travel-tainer from Vittles Vault is a food storage container that aims to keep your pet food fresh. By screwing on the lid airtight it will keep the odor in and the food will last longer. This one doesn’t have any collapsible accessories but it’s still a compact design due to the included bowls that sit on top and under the food container as seen in the picture above. This way, it’s portable for traveling, while being hard plastic bowls that some people like better than collapsible bowls. Two bowls mean that you have one for food and one for water. There is no water container included. A handle keeps the bowls in place with the container between them and makes it easy to carry around. There is also a handle on top of the food container that you fold up to use. It comes in pink and blue. The Travel-tainer holds 3 quarts (12 cups) of dog food which should last toy and small sized dogs a week easily. It should last a medium to large dog a weekend away from home at least. 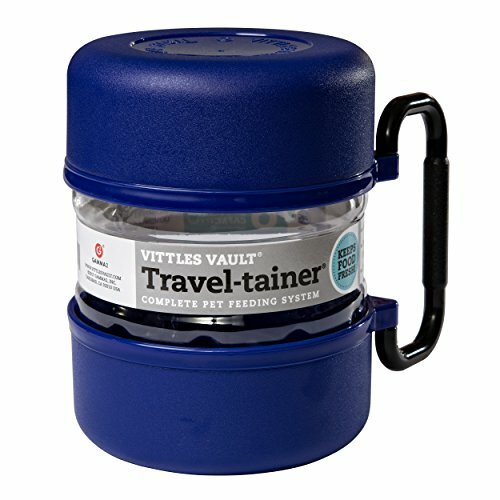 Vittles Vault Gamma TRAVEL-tainer uses FDA approved food-grade materials and is BPA-free. If you’re interested in whether BPA levels is something that affects your pet, check the FAQ at the bottom of the article where I answer a question about this. I like the compact design of this product. It can hold a lot of pet food and the bowls are smartly wrapped around the container during travel. What I would have liked to see is a model that is split up in the middle into two compartments so you could also bring water. You could put a small water container inside of this big food container and bring it on a hike. But in my opinion, there are better solutions for hiking, although this is the only one we’re looking at today that has solid plastic bowls and not collapsible. It will be up to you what you prefer. Collapsible bowls are awesome while traveling with space and weight limitations. Comsun sells a three pack of collapsible bowls that you can use for food, snacks or water. They are made out of food grade silicone. BPA and lead-free which I love. There are carabiners included so you can hang them on your backpack or a hook in your RV. The reason I love collapsible bowls so much is due to the small amount of space they take up when not in use. These are only .5 inches high when folded down. This means that I can put them in a backpack and they won’t take up much space. Silicone is also lightweight. Another cool thing with these collapsible bowls is that you don’t have to fold them all the way up. You can stop in the middle and have a medium sized bowl instead. I appreciate the included carabiners. Again, small things matter and even though you could go out and get some carabiners yourself, I like it when the company has thought about how the product is used and how it can give you ideas on how to use it. 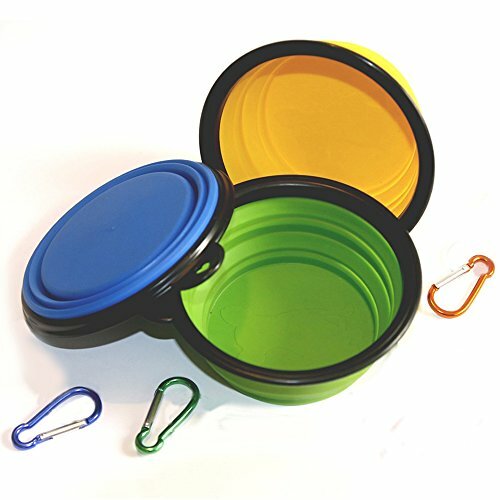 I have a few collapsible bowls in my kitchen but none of them have portable features like this one with the little handle for the carabiner. Note that these are pretty small sized and fit small pets the best, Comsun also make a model for medium and large dogs that you can find here! 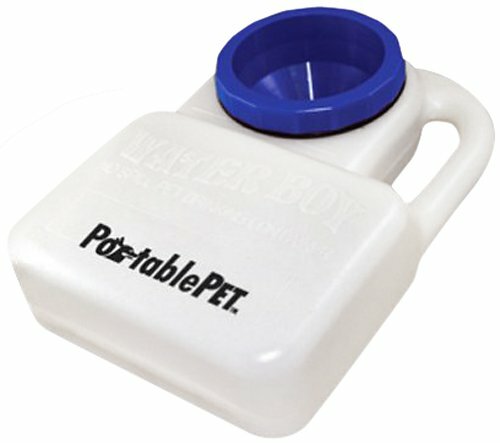 The PortablePet WaterBoy will get the prize today for the best bowl to use during a car ride or in your RV. This is a water container that can hold 3 quarts of water. A big handle makes it easy to carry around and a big hole makes it easy to fill up. Designed in a way that will stop water from spilling and make it easy for your pet to drink it, the WaterBoy is the essential pet product for the road. It’s big enough for big dogs, and unless you have ten big dogs in your car that needs water, 3 quarts should last long enough on the road to not have to fill up at every rest stop. Thanks to the durability of this product I also wouldn’t think twice about putting the PortablePet WaterBoy outside my trailer and carry it around everywhere. This could easily be used as the primary water bowl for your pet due to its versatility and ease of use. When not in use it can stand upright for storage. The easiest way to clean it is by using a bottle brush, but the handle-part is tricky to get through. It’s not impossible though, so don’t let it discourage you too much. This water bottle for pets is the most innovative product I have seen today, but it has a few shortcomings. The bottle is made by a company called Xuanrus and it has a built-in water dispenser for your pet. Fill it with water and then move the switch to let the water run through to the upper part where your pet can access it. It can hold 14 oz of water. A built-in carbon filter will remove chlorine and eliminate odors. Xuanrus recommends changing the filter once every 2-6 months depending on use. Thanks to its design it’s easy to handle with one hand. This is an excellent product to bring on a walk or a hike where you don’t want to stop and pour water in a bowl. Just hold it in front of your pet and flip the switch to get some water going. The width of the bottle is only 2.4 inches which means that the water bowl part isn’t very wide, this can be a problem for medium to large dogs. I wouldn’t have minded a small compartment for some pet food storage on the bottom for example. It is already pretty tall though due to the water dispenser. They could’ve made it smaller by making the dispenser fold out instead of always sitting on top. The XUANRUS Water Bottle is a good product if all you’re looking for is a water bottle you can bring with you on a hike with your dog. There sure are some options for travelers with pets. I hope you feel like you have gotten some help in search of the best travel bowls. I have answered some questions in the FAQ related to this and let me know in the comments if you have any additional questions. 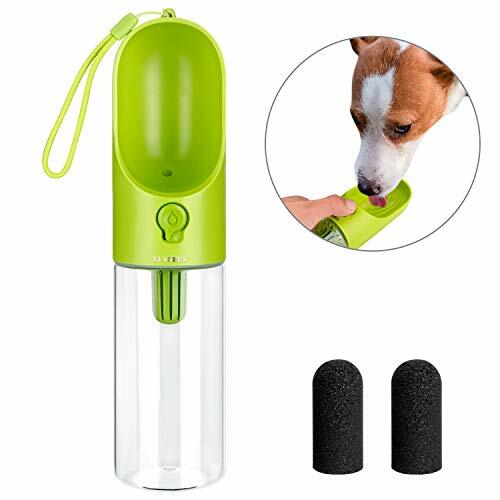 Travel Water Bowl: PortablePet WaterBoy Travel Water Bowl is the best versatile water bowl for your pet, especially since it’s car friendly. Your water won’t spill, and a big handle will make it easy to move between places. Durable, lightweight and safe materials make this a winner in the water bowl category. Hiking Water Bottle: XUANRUS Water Bottle – The water bottle from Xuanrus is a neat product that would be perfect for a hike with your dog. With space for 14 oz of water and the ease of use for both you and your dog, you won’t wanna go without it when you’ve gotten used to having it. 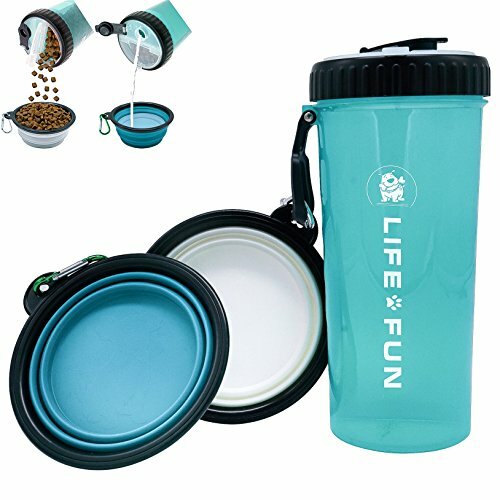 Hiking Water & Food Bowls: LIFE4FUN Water Bottle 2 in 1 – The 2 in 1 solution by Life4Fun is my favorite hiking-friendly product that I have looked at today. Reason being that it lets me bring both food and water, and it comes with bowls to put it in. The Trip: Dog Travel Food Set 7pk – This pack with seven pieces is great for the weekend away from home. In one bag you will get enough containers to bring food in, together with a scoop, bowls, and a mat. All you need to do is bring some water in a container unless you have access to water where you are going. Note that this model is for smaller dogs, but they make one for medium and large dogs that you can find here! 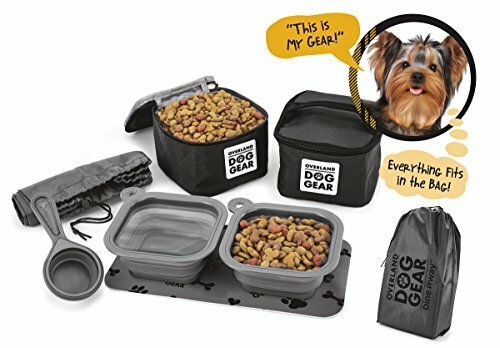 What should I look for in a travel food/water bowl? Portability – Dimensions and weight matter. How big and heavy is it for what you get and need? Health – The materials used should be FDA approved. We want to stay away from products that are not BPA and lead-free. More about this in a question below. Overall travel-friendly features. Is the lid screw on? Airtight? Leak-free? Bags? Handles? Will water/food stay if I move the product from one place to another? The things that make a product easier or harder to use based on how it’s designed and how it functions. Can I bring my cat or dog on an airplane? Bringing a cat or a dog on an airplane with you is not impossible, but it all depends on the airline you’re flying with. PetTravel.com has excellent information about what rules each airline has and I recommend reading on their site about what you should think about and need to do when traveling with your friend. Asking the airline simple questions about this when booking your ticket is also recommended to make sure you have the most recent information. What is a collapsible bowl? A collapsible bowl can fold up or down to make itself bigger or smaller for your needs. It’s made out of silicone so it can bend easily. It goes from looking like a silicone plate to a silicone bowl. The best thing about collapsible bowls is that they get very storage-friendly when not in use. And since it’s made out of silicone, you don’t have to worry about them breaking when going down the road. There are a lot of collapsible kitchen items that make it easier to organize the RV. What about a portable cat litter box? There are portable cat litter boxes so you don’t have to bring a big one if you’re traveling. This one from Pet Fit For Life is a collapsible one that even comes with a collapsible water bowl. It’s 16 x 12 x 5 inches which should be enough even for big cats. Having a collapsible litter box can be great for weekend trips in the RV so you don’t have to bring the one from the house. If you live full time in the RV, I would recommend a more permanent solution with higher durability. The one I use in my home is the PetFusion BetterBox which with its high walls stops litter from flying out and makes it easy to clean in and around the litter box. There are also disposable cat litter boxes for smaller trips. Like this one by PetSafe which could be enough if you’re going away for a few days. This is a an excellent solution if you’re staying in a hotel room. The crystal litter helps with odor and the fact that it’s a box means that litter won’t be flying all over the hotel room carpet. Do BPA levels matter for my pet? Even though we don’t know the effects of BPA on people and animals yet, it’s good to be cautious and choose a BPA-free product. Plastic bowls are known for having higher BPA levels which is why glass and stainless steel products are often recommended instead. We’re looking at products meant for traveling, so we care about how light the products are. That said, we also care about the health of ourselves and our animals, so the best thing to do when picking a product is to contact the company and ask what chemicals they use in their products if you’re concerned if they’re not already marked as BPA-free. If this is something you’re concerned about, note that it’s known that canned dog food often raises BPA levels in dogs. You can read more about this subject here. If you have any more questions, let me know in the comments below.